Polka Dot Shirt, Loafers: Thrifted. Bayla Skinny Jeans: c/o Aeropostale. 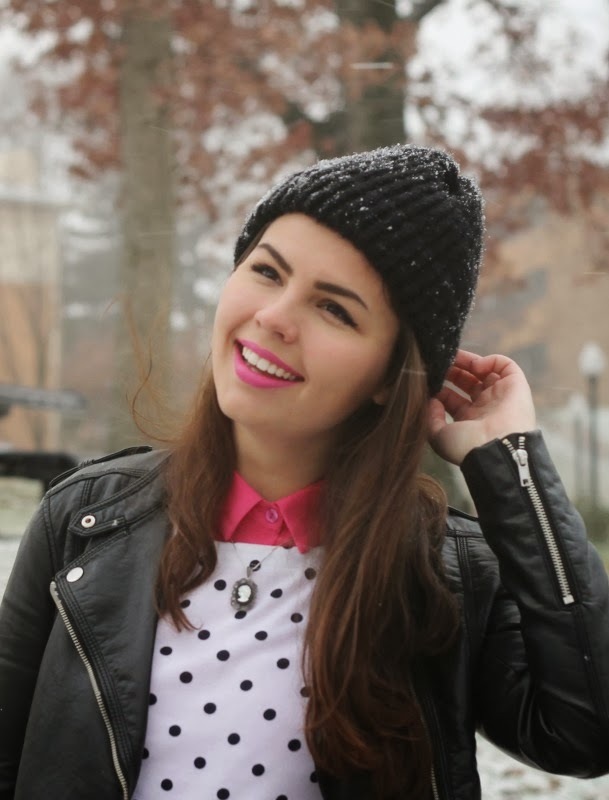 Lipstick: Combo of Mabelline's Fifth Avenue Fuchsia and Fuchsia Fever. It was a goal of mine for November to wear more looks with pants anddddd I've only worn one so far. Definite oops. So, I tried a look out with them today! I've had these jeans from Aero for a few months now and have never got around to wearing them. You can't tell from the photos, but they're actually two toned with the front panel being blue jean and the back panel being black jean. Different than any of the other jeans I own! I was always having trouble styling them up with the two tone, but I thought it might be easiest to pair them with black. Bummed you can't see the detail, but I will without a doubt be wearing these again! Speaking of Aeropostale--I'm going back to working there over my Thanksgiving and Christmas breaks. Which means as you can assume, yep, I'm working Black Friday! I'm actually super excited and can't wait. I love the thrill of a busy store, and this will be the first black friday I've ever worked (hard to do when you're a life guard or hostess). I'll be working 2 A.M. to 11 A.M. which is prime time. Be nice to the sales associates that day if you go out and think of them as me! That's a lovely shade of lipstick! Uggggh. Good luck! I worked retail for 8 years and man, black friday was black indeed. You have a much better attitude about it than me, though. Lol. Love the outfit! The pop of pink is genius. 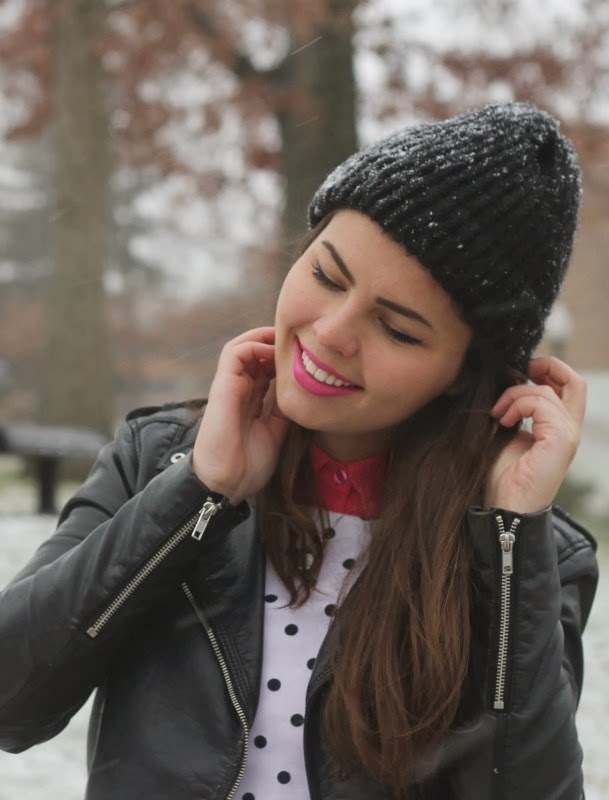 I love the layering of the collared shirt under the polka dot one! Too cute! Good luck on Black Friday, at least you get to be done early in the day, it'll fly by! Awww, it' snowing! So lovely! It should start snowing here in Romania any day now! I'm super excited! I love winter! You look beyond cute! This look is so cool! I've never seen jeans like that (but yeah, you can't really tell what they are by these pictures.) I also love that you're wearing that hat! 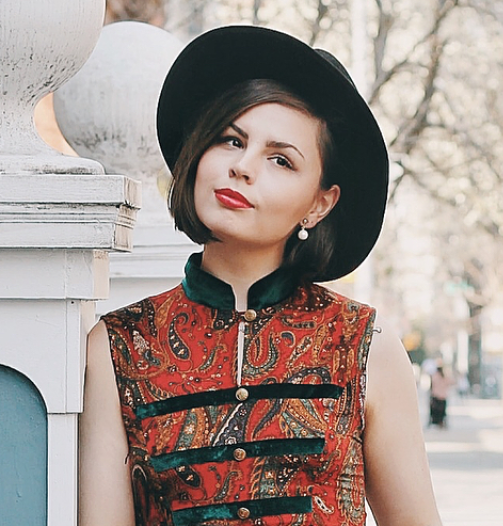 I've been trying to figure out a way to wear a hat like this without feeling like it's ruining my outfit and this post is definitely helping me figure it out! 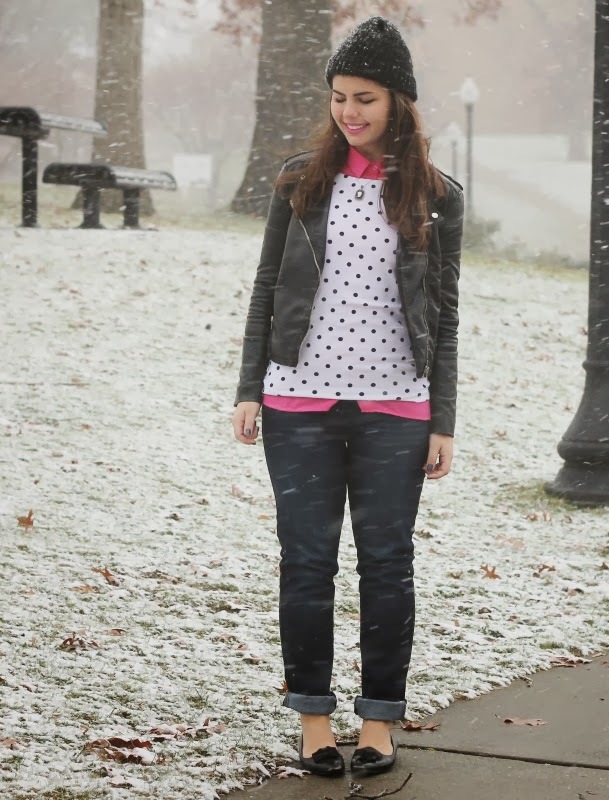 This is such a cute outfit with the polka dots and pink! Those jeans look great on you! I thought of you when I went to the mall on Black Friday - I saw an Aeropostale and thought, "Hmmm, I wonder if Lauren is working!" Hope that you had fun! My Go To Skin Products. Cute Boys & First Snows.